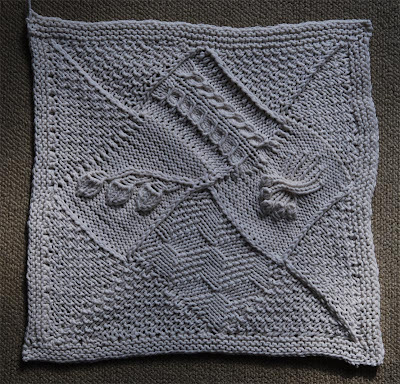 I've been good and actually did sew together all squares of the afghan (there are a few strangled threads left, but I'll take care of them later). 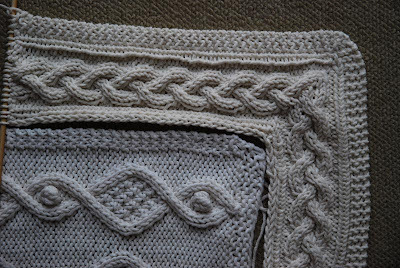 I've also started on the border, which will take some time. So far, the afghan is 180 cm by 120cm, which makes for 6 meters of border. For distraction and also in a weak attempt to reduce my stash (weak, because I added so much the last couple of weeks, three hanks of yarn less are not going to be noticed) , I started another experiment on felting. This time I certainly can't complain about the finished object not being felted sufficiently. 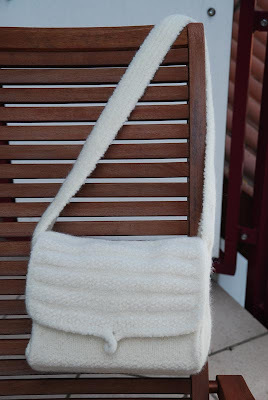 The original inspiration is the pattern Percy, though this bag is not felted, and there's also a additional inner pocket, which I left out in the end because the bag turned out so small (I did start knitting it, though). It did shrink by about 30% in the washing machine and it produced a lovely tight fabric. The strap *is* too short, but I can't really change that now. I'm thinking about some additional decoration, but haven't decided yet. 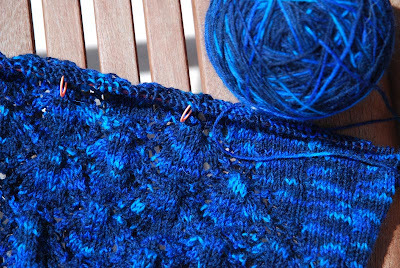 I also started on a new project, a lacy wrap called Juno Regina. The yarn is Trekking Hand Art and I do have three hanks, so I could go for a nice, large wrap. But one of the hanks turned out to have much less of the lighter blue in it as the other two, so I will first see how far I get with the two lighter hanks and then decide if I do add the third one. The warp (at least the way I'm going to make it) is knitted from both tips, so if the middle bit turns out to be somewhat darker, it shouldn't be a problem. - Block 22: GAA #12: Another entrelac. 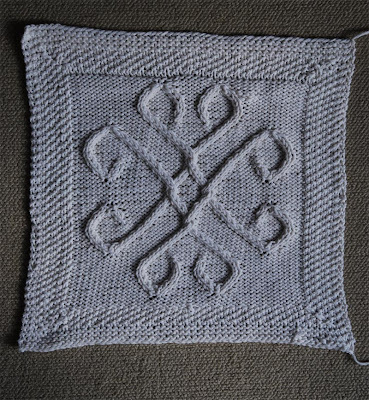 This one I enjoyed more than the other one, maybe because the entrelac goes over more stitches - less turning around the work. 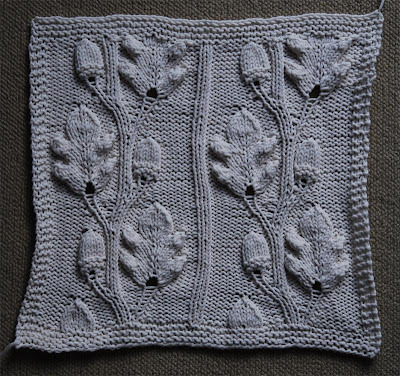 On the other side, I finished knitting Hanami. Below is the shawl pre-blocking and all scrunched up. It looks to be 30 x 110cm - which is waaaaay too small. I started to block the living daylight out of it though, and now I'm at 40 x 140cm - which is better, but still, I think a bit on the smallish side. I'll need to do some deep meditations (maybe while a sew together the monster afghan) to decide if I do it again with more repeats / different yarn / larger needles. For blocking I used welding rods in lieu of blocking wires and it seems to work pretty well, though the threating of the stole on the wires is a bit painful. The matte is one of those puzzles things for kids, which I bought two packs of last week when they were on sale. One of my better buys I think. 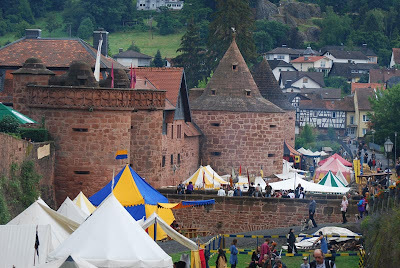 Last week friends of mine sent out an e-mail about an Renaissance Fair in Büdingen, which is about 60 km away from where I live. I joined up with another friend and drove there today. 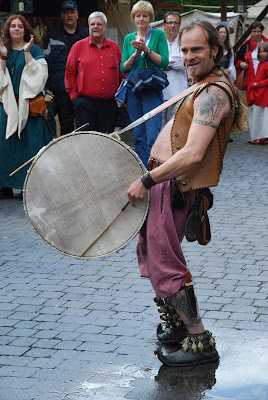 The fair is held every other year in the old center of the town, which is considered one of the best kept medieval strongholds in Europe (I didn't know that before). It's spread out over a surprisingly large area, which made for a rather roomy event. Most of the fairs I've been to are usually rather crowded, but here you really could get around and see many different things all over the place. 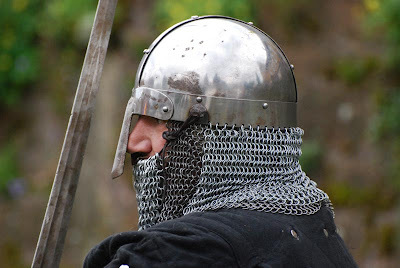 There were a large number of people in medieval garb and it was very obvious that many people used it to meet up, and that they generously suffered the presence of all those modernly dressed people. 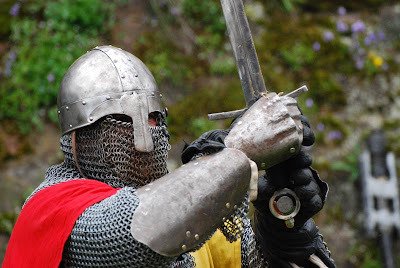 Of course, there were also knights. I don't actually think there's a tournament, but that they just hacked at each other for the fun of it. 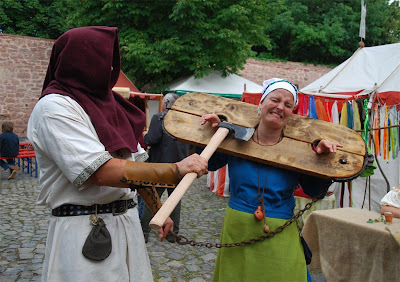 Misbehaving people where treaded befitting their crime. ...or, maybe they just did it for the fun. 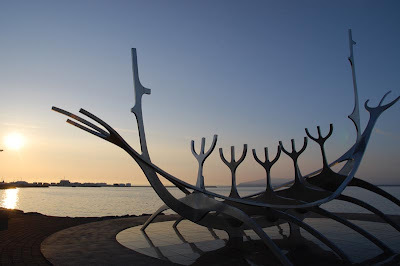 Iceland's people are still rooted in some of the Nordic mythologies. Allegedly, they still believe in trolls and elves. 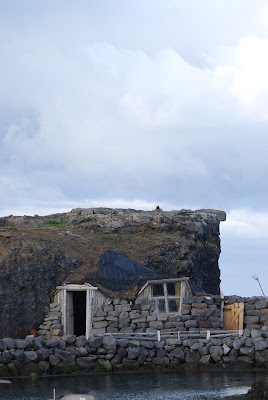 We found this troll house at the harbour of Keflavik at our first day in Iceland. Inside, the furniture is three times as big as normal beds or tables and if you listen very hard, you can hear the troll snore in his sleep next door. 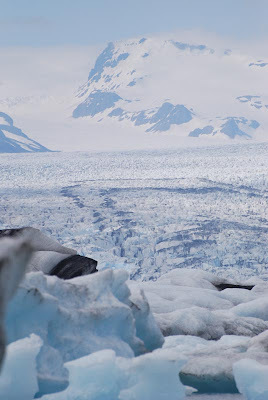 Iceland, being an island, has a lot of water around it and many, many lighthouses. I can't show a picture of each one, so this one has to do. 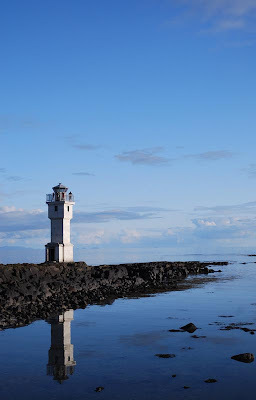 It's the one of Akranes on the West coast on a sunny and very quite evening. We didn't plan to, really, but we happened to be in Reykjavik on Iceland's independence day (17th of June). We saw the prime minister and the president of Iceland lay down a wreath at the stature of Jón Sigurdson (a Icelandic freedom fighter) not twenty meters away from where we stood and then joined the party that broke out all over the city. 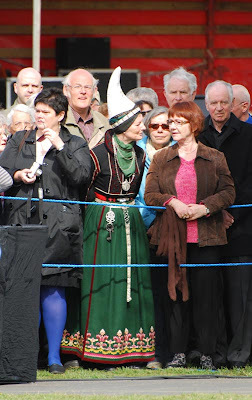 We also saw some people wearing traditional clothing. I simply loved that one. 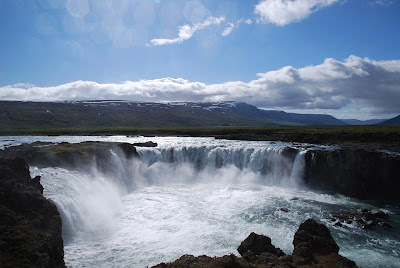 One thing I came to Iceland for was the waterfalls. 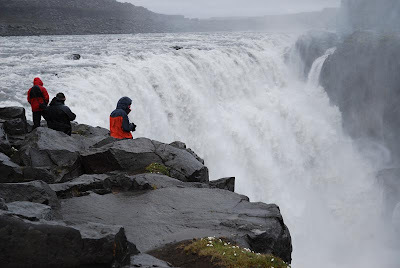 The biggest one is the Dettifoss, which is seriously impressive (maybe not Niagara Falls impressive, but pretty close to it). It's in the middle of nowhere, with one parking lot close by reachable only by a 30 km gravel road (and I'm generous there - the road was terrible). What the picture doesn't show is how friggin' cold it was that day, and how windy and rainy. 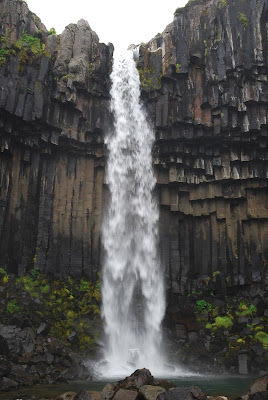 I saw a picture of this waterfall (Svartifoss) in a wall calender I've got for this year and just knew I had to get there. It was a 40 min steep hike to get there, but well worth it. I love this sculpture in Reykjavik. It's called the Sun Voyager. I spent the better part of the last three days to condense the number of pictures I took in Iceland down to a more manageable level. Of course, I can't show all of those I loved most here, so only a small selection. 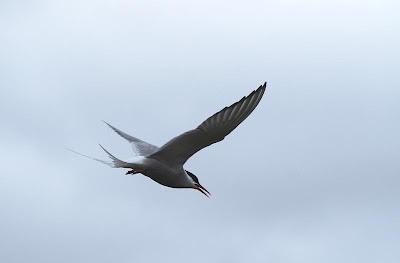 The picture of the seagulls was taken close to a small lighthouse on the Western most tip of the Snaefellness peninsular. It was a bit of a bumpy right to get there, but when we finally reached the lighthouse (in a lovely shade of bright orange) we already saw seagulls and other birds in the air. Stepping up to the cliff edge we already could see the first nests. My friend (who has a touch of vertigo) was very happy when I finally crawled back from where I was laying on my stomach to get this picture. 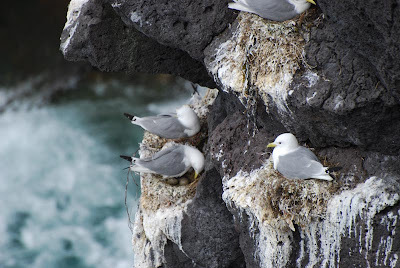 These bird were found pretty much at the same location, they just nested closer to the water. 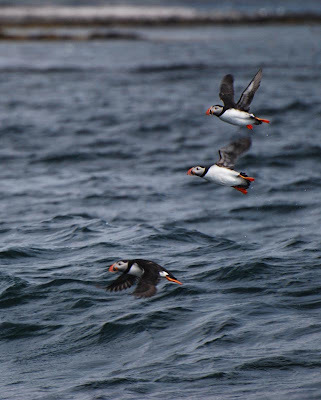 When we were in Reykjavik, we took a boat out to one of the smaller islands in the harbour to go and watch for puffins. We didn't get quite as close as I would liked to have, but eventually we got good at spotting the birds in the water and take pictures just when they were taking off. I love those little fellows, they are really cute. In Höfn, a smallish town on the Soutch coast (well, maybe smallish for most of the world - with more than 1.600 people living there it is after all the largest settlement on the South coast), we took a little drive around when we noticed sea swallows sitting practically everywhere; including the street. When we got out of the car, I got flashes of The Birds by Hitchcock. Luckily, none of the birds got really close, but still, it is a bit spooky. So much for the birds. 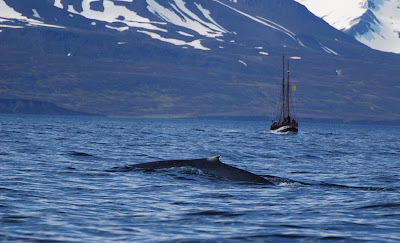 In Husavik, on the North coast, we went on a whale watching tour. I've seen a couple of different whales over the years but this was the first time I got a big blue whale. They are really, really big. They are also not very good to take pictures of. 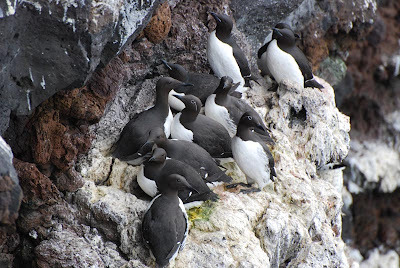 You can spot them easily enough, but unlike the orca or, say, the sperm whale, they aren't usually into showing off, and when they dive, you don't even get to see the fluke. If Iceland is famous for one thing (except for a crappy economy) it's the famous Iceland pullover, made from Iceland wool, taken from the Iceland sheep. You can seen sheep in all places, sometimes walking along the street you want to drive one. 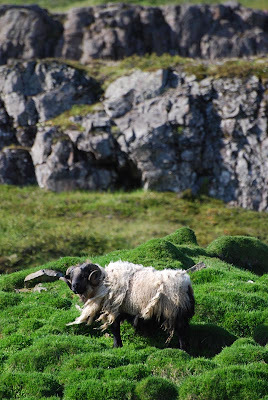 This one obviously has not been sheared and is in the process of loosing its winter coat. 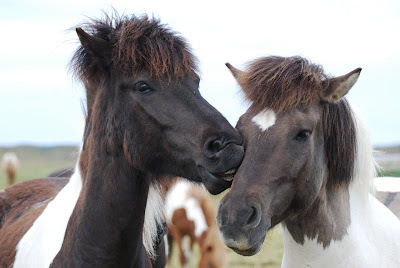 One thing my friend was particularly eager about is the Iceland horse (not that I blame her, I love those little horses too). Though we didn't take a ride, we at least stopped once in a while to take some pictures. I believe those two are from the last day we were in Iceland.